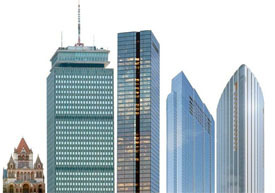 The Boston office market has big movers that need to make some real estate decisions. The market continues to tighten and blocks of 100,000 square feet and above are harder to find. Banks continue to move employees into smaller workspaces, with the industry average now 150 square feet per employee, down from 225 square feet in 2009…many banks are [also] choosing to relocate offices. Only 25 percent of the financial services office deals tracked by JLL in 2014 were lease renewals, while 46 percent were relocations. That trend is likely to continue in Boston, with three major financial institutions responsible for 33 percent of the total active requirements in the market. But the result likely will be a net decrease in occupied space. Putnam Investments and Wells Fargo are in the market for 280,000 and 220,000 square feet, respectively, while BNY Mellon is seeking to downsize to 350,000 square feet. And available build-to-suit parcels in the Seaport District provide competition to existing office towers in the Financial District. The city of Boston that is home to a wide variety of college, universities, professional sports team, hospitals and companies is changing. We have created the Back Bay, built office tower and now adding more buildings to our skyline. No longer are the tower views home to companies, but residences. Today, Boston Properties, one of the city’s most prolific builders, is developing a 17-story office building on the final parcel within the Prudential complex. Meanwhile, the area around the Pru is exploding with new projects and proposals for hotels and towering residential buildings. Not coincidentally, the city’s population is rising more rapidly than it has in decades. The total head count rose by nearly 30,000 people, to about 646,000, between 2010 and 2013, according to the US Census Bureau. That’s more population growth in three years than Boston experienced in the 1980s and ’90s combined. 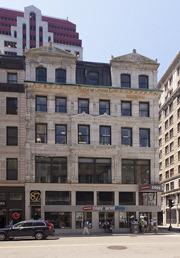 0	87 Summer Street office space: affordable Downtown Boston option? Boston Realty Advisors represent the 2,162 RSF on the Mezzanine level of 87 Summer Street that is priced in the mid to upper $20’s. This building is owned and managed by Synergy Investments that controls in excess of 3.5 M RSF of Class B product in Boston. In the heart of Downtown Boston, 87 Summer Street offers cool collaborative space with full floor identities. This property offers Verizon & Comcast with high speed connectivity, and many other local amenities. 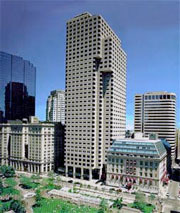 87 Summer Street is located within the Downtown Crossing Business Improvement District. Just a short walk to public transportation such as the Red, Orange & Green Line T stops, along with the commuter rail at South Station. There is also a wealth of parking within the area.